Sometime ago, I mentioned that I'm pursuing a 1200-Calorie Diet Plan, to date, I'm on my 18th day (3 full weeks less weekends, and 3 Days). I'm a girl with a hearty appetite, it's been a struggle to go back to my pre-pregnancy weight, and that was eight years ago. Aisshh! Suffice it to say that albeit I seemed desperate, cocktail-ed dozens of diet pills and teas (except Bangkok Pills. Hah. ), but more often than not, the urge always win! I just had a thousand and one excuses, now a little lesser. Plus, I don't even take kindly to the challenges that my husband post to me, instead, I take offense and rebel and eat a whole lot more! Oh my, this was even with paid incentives to please lose weight. I'm usually a hopeless case, except when I'm inspired (and that is usually when the Korean fangirl obsessive mode kicks in! haha!) So I'm happy to say, that this 1200-Calorie Diet Program is something that's workable for me. 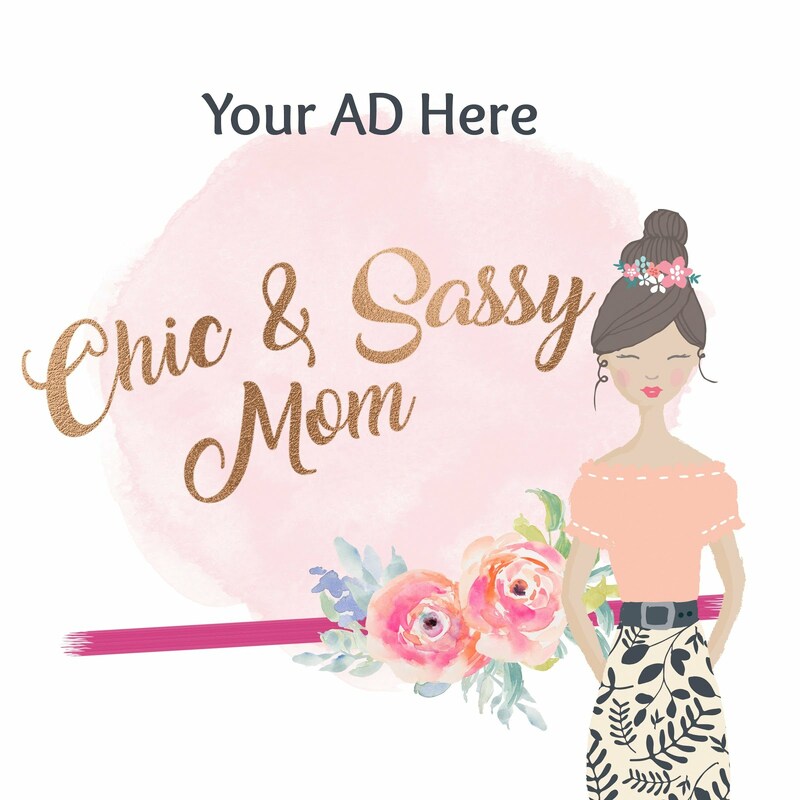 So far, I tried three companies or diet delivery providers, namely The Happy Diet, Lunchbox Diet, and Happy Diet Delivery. Tomorrow will be my third week with Happy Diet, spot on, I can say that this is my fave 1200-Calorie Diet Meal Plan provider to date. Love: The flavorful, multi-cuisine and satisfactory servings of the three main meals. I absolutely look forward to each meal. 90% of the main meals, I love. The snacks usually have the fat burning soup, and a fruit serving. The snacks are not really on the sweet side, not a cup cake or cookie. Initially, I was concerned because I'm a dessert person, and that's the closest thing to satiate my cravings. Overtime, my sweet cravings are controllable. I can do away with desserts. Although, lately, I'm so busy with work, that I missed on snacking. It's not recommended, as it's best to eat frequently, 5 meals in total (3 Main, 2 Snacks). Since I love food, and dine outs, regardless of cuisines, Happy Diet delivers in making me feel that I'm not tediously on a diet! I'm feeling less deprived every time. Plus I can feel the tender loving care in the food preparation. 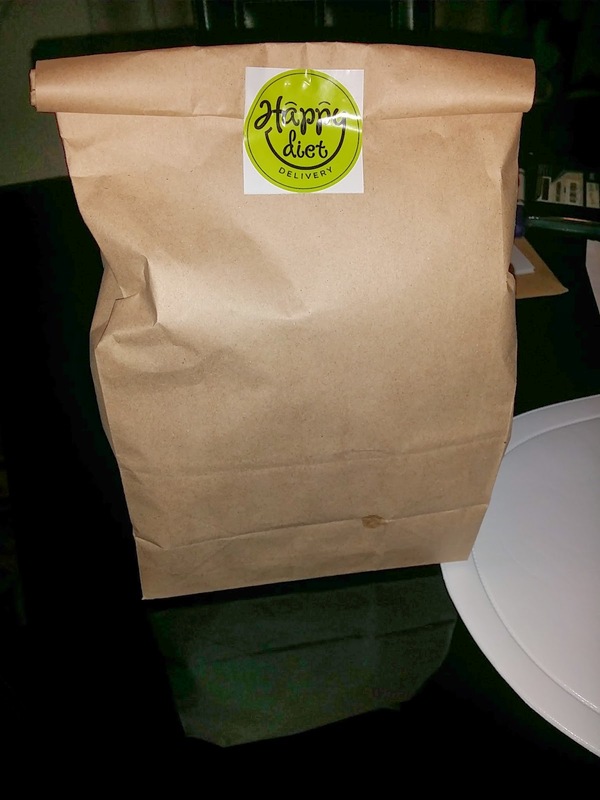 Happy Diet Delivery cost Php 2500/ 5 Days. You can reach them in their Instagram account @HappyDietDelivery. The Happy Diet is another provider that I tried, and might probably also consider to trying back. In a spur of the moment decision, I started mid week with them, and I'm grateful that they were able to take me in. 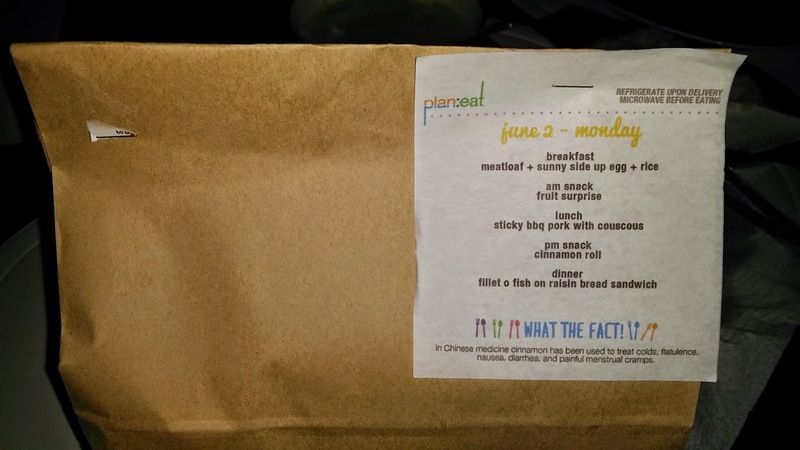 The 5-Day week 1200-Meal Plan subscription costs Php 2000. The main meals were also as nice as Happy Diet Delivery's, while the snacks can almost pass as desserts. I especially love the trail mix. Since you got some calories skewed on the snacks, the main meals would appear lesser than that of Happy Diet Delivery's. In time, when I'm used to eating really little just right, and already acquired that habit, it's a relatively more affordable alternative to Happy Diet Delivery. You can reach The Happy Diet on their official FB Page. Lastly, and certainly for those with innately little appetite to eating, there's Lunchbox Diet. 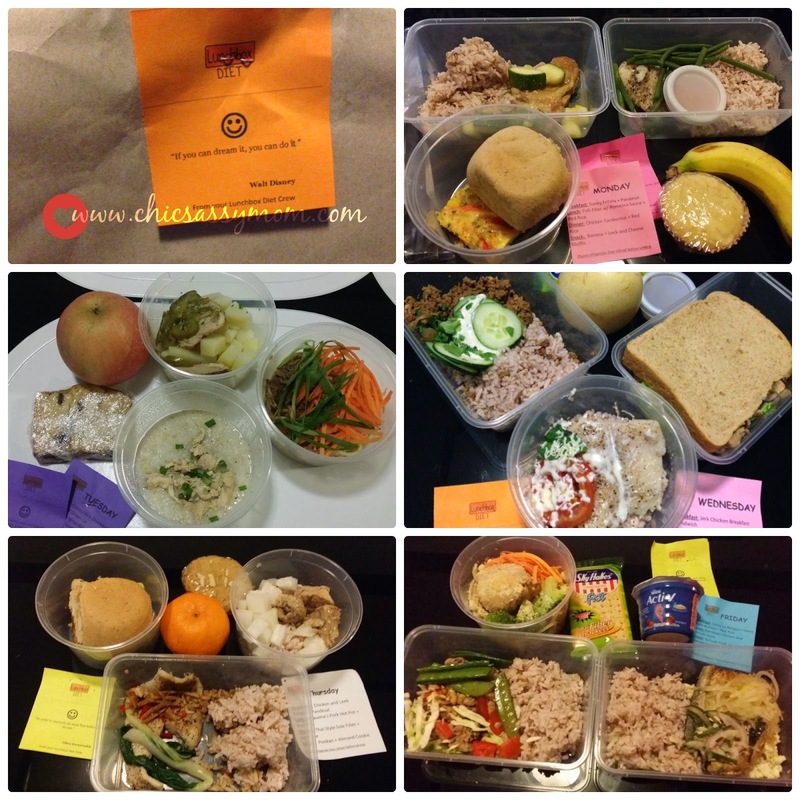 I started with a high expectation of the Lunchbox Diet, it has a great following, plus it's the most affordable of the three that I I tried at Php 1700 for the 5-Day Subscription. As expected, they are very efficient, nicely packed cutlery set. And yes, they got me at their desserts snacks. But personally, the main meals spelled that I was on diet (most can use a little bit of salt and flavors please). Although, my average daily weight loss while on them were a bit higher, I was dropping close to a pound per day. So it must be the upside. You must think that I'm already back to my pre-pregnancy weight (I was 10 pounds away when I started), well, I'm not yet there! I'm still a couple of pounds shy away from it. I can say that it would have been sooner, on my second week, after Lunchbox diet, if only I didn't go partying that Friday night and went on a bit of a drinking fest. The week after that, not by choice, but we had to go on a buffet, believe me I was already trying hard, but my best wasn't enough. I like that Happy Diet Delivery gave me a cheat day guide, no pork and fried. This weekend, I almost did comply. So let's see next week. I will update this post on an ongoing basis. From last time, I actually went back to my pre-pregnancy weight. Yay! But, after our month-long vacay in the US, plus a weekend in Hong Kong. I gained most of it back! Oh no! For a week, I tried doing it on my own without a Diet Subscription, enough said, I couldn't do it. So I went to try another diet subscription, Plan Eat. First ever deliver came with an Eco Bag. 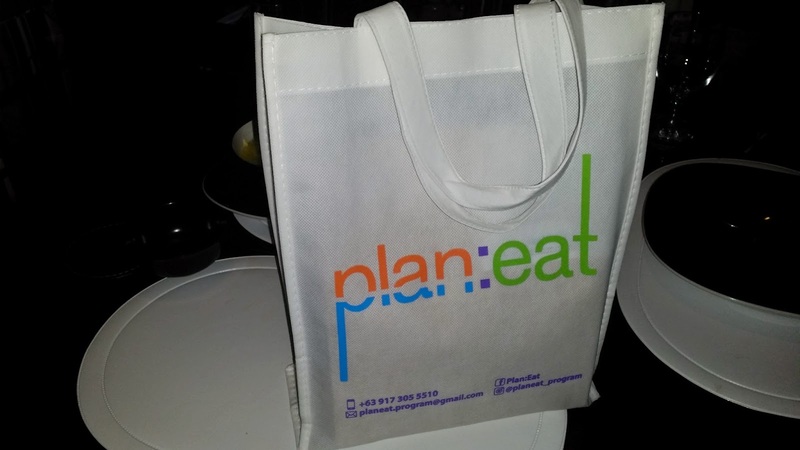 With Plan Eat Program, 1200-Calorie Diet Plan is only Php 1200 ++ (Delivery Charge), so yes, the price is very, very right! I think what makes the price workable is the white rice instead of a more expensive red/brown rice. But white rice has more calories, so the viands tends to be lesser. Still very flavorful. For the two snacks, you get a fruit surprise and a treat (chocolate cake, cheese cake etc.). It comes with a coffee (90 calories), what I do since I need my coffee, I switch it with the sugar free version at 45 calories each. I get to enjoy two cups instead of just one. My only problem is I'm only human I'm so easy to get. I cheat, even harder on weekends! So I'm still a couple more pounds away from my pre-pregnancy weight. With white rice (still at 1200-calorie meal plan), the average daily weight loss is one pound, with 99% compliance to the plan. Take note. Hah. But I want to be on a 120ish level. Oh yeah, bring it on. Aja! Aja! Fighting! I think I need to exercise. Hmmm. So yes, that's it for me today. I will keep you posted. Hi there. :) Go! Go! Go! 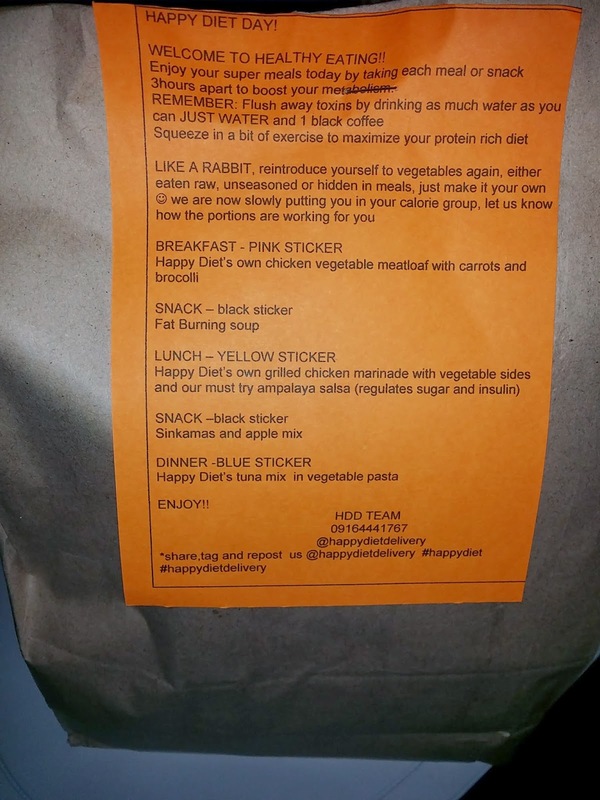 Would love to try this too especially the happy diet delivery. Question: what time does it usually deliver in the morning? Sana it would fit my schedule. @Gellie, thank you! You're in Pampanga? Will keep myself posted on your updates. ^_^ Hope to see you there! My friend just signed up with Lunchbodiet. Though I liked the idea that food is already prepared so it's less effort on my part, the damage discourages me. I think I can prepare the same meals for lesser the price. Somehow I find the 2k per week a little too much. Wow! talaga naman mkkpag diet ka,kung everyday eh ganyan ang kakainin mo,last year nag plan ako mag diet & exercise,pero hindi ko pa din talaga magawa,Hays!gusto ko sna i try ito,nakita ko na ito sa isang page eh,very interesting talaga! I want to try it! Lalo na ngayon diet din ako ! Thanks for sharing this, I should try this, I need to lose weight! I want to try! Hoping! Wow I want to try this, I want to lose weight! Thanks for sharing this! 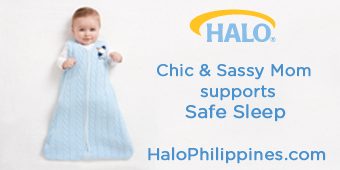 do they have a branch here in bulacan,i want to try this program,im having a hard time dieting!